Admiral Collins, Commandant of the US Coast Guard has presented Commodore Everette L. Tucker, Jr. with the US Coast Guard Auxiliary Exceptional Meritorious Service Award. While serving as Auxiliary Immediate Past Commodore, Auxiliary Director, International Affairs and Chair, Auxiliary Liaison Committee, Commodore Tucker participated in the planning and execution of the ISAR 2001 and 2002 and is a very good friend of the CCGA. 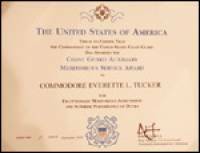 Congratulations Commodore Tucker!